What are Lix and Rix? Similar-sounding but with minor differences, Lix and Rix are two versions of the same readability formula. They both measure readability based on letter counting, rather than using the syllable counting method of many other formulas. Because syllable counting may prove inaccurate in non-English languages, Lix and Rix’s letter counting method is more suited to this purpose. Lix was developed in Sweden. It was created by Carl-Hugo Björnsson in 1968. He published it in a book called Läsbarhetsindex - translated, ‘readability’. He called it ‘Lix’ for short. Compared to other celebrated formulas, it was obscure at the time of publication. This was probably due to all the reporting on the formula being written in Swedish. Björnsson created the formula by establishing a stable criterion to ensure accuracy. He had 162 books rated for readability by teachers and, interestingly, groups of students. The 162 texts included textbooks, fiction and technical literature. This ensured that a range of literature was represented. At first, he considered a large number of text features to measure against his criteria. This included sentence length, complexity, unusual words, central words and different words. Eventually, he whittled these text features down to just a couple which consistently predicted readability accurately. These features included a word factor and a sentence factor, similarly to some other formulas. Several other formulas count syllables and unfamiliar words. This works great with the English language but has limitations elsewhere. Lix calculates the percentage of words with seven or more letters. The way Lix calculates the sentence factor is similar to the Flesch formulas, Spache and Fry. It’s the average number of words per sentence. The word and sentence factors are weighted equally. The Rix formula was created over a decade later by Jonathan Anderson - the teacher from South Australia, not the fashion mogul. Anderson wanted to convert the formula to a grade level because many teachers and librarians find a grade level useful. He did this by determining cut-off points in the Lix score to determine grade levels. Then he tested this for validity and replicated it in his modified formula - Rix. As a basis for his own formula, he first conducted his own study on the validity of Lix and went about converting it to a grade level. The criteria he used reflected an international reading study by RM Thorndike in 1973. He used the same texts from this study to test Lix. He found that Lix reasonably correlated with Fry and ran slightly lower than Flesch, but no more than half a grade level. In a second validity study, he used cloze techniques - a kind of comprehension test where subjects are asked to guess omitted words in a passage. The cloze testing indicated a high level of accuracy of Lix due to the wide range of texts the formula encompasses. Recall testing was also used to test the number of memorable content words which also showed positive results regarding Lix’s accuracy. Satisfied with this, Anderson made a table which reflects a fairly reliable conversion of Lix scores to grade level. He then created his own slightly modified formula and called it Rix to differentiate the two. The results of Rix correlate almost perfectly with Lix. When are Lix and Rix most useful? As Anderson stated in his study, both formulas are very useful for determining the difficulty of a text for education purposes. Education is at the core of any society and it can’t be overstated how much responsibility teachers carry to educate with the right tools. This is especially important when trying to select texts appropriate for their students. Especially for younger children who are in the early stages of learning language, it’s important to strike a balance. Pick a text too simple and the student won’t be engaged or challenging themselves. Pick a text that’s too challenging and the learner will be discouraged. One advantage of Lix and Rix is that due to the variety of material their testing encompassed, they can be used reliably for a wide range of ages - from texts for young children to adult reading material. So, for teachers and librarians, the Lix and its grade level variation Rix are invaluable formulas for helping them to categorize their books by difficulty. Lix has also been the subject of a study on the readability of several non-English languages. A study focused on the use of Lix with French, German, Greek and English texts. It found that the study of readability for non-English texts had previously been a major shortcoming and that Lix is a promising solution for foreign language readability. It also points out that the simple formula’s lack of syllable counting, by contrast to many English formulas, avoids differing syllable use in different languages. 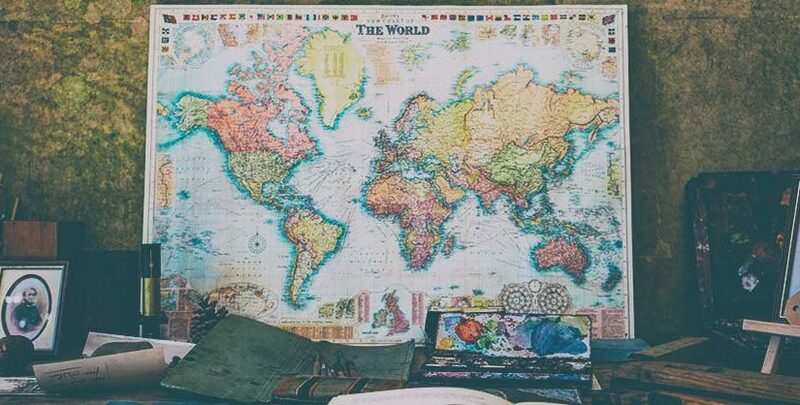 Ignoring linguistic rules of syllabification, therefore, gives the formula great potential to be useful internationally. The conclusion of the study was that Lix should be ‘readily interpreted in languages besides Swedish’, the language the formula was originally written in. This opens up a world of possibilities for content writing to write for a wider audience. After having a text translated to a non-English language to meet the demand for that language, you can also test its readability. Your text may not be lost in translation, but too many long, rambling and sentences and difficult words where simple ones would do may leave your audience equally baffled. Lix used to only be popular in Scandinavia - now the rest of the world has caught on. You won’t need to do the calculations by hand - ReadablePro will tell you both the Lix and Rix scores of your content. 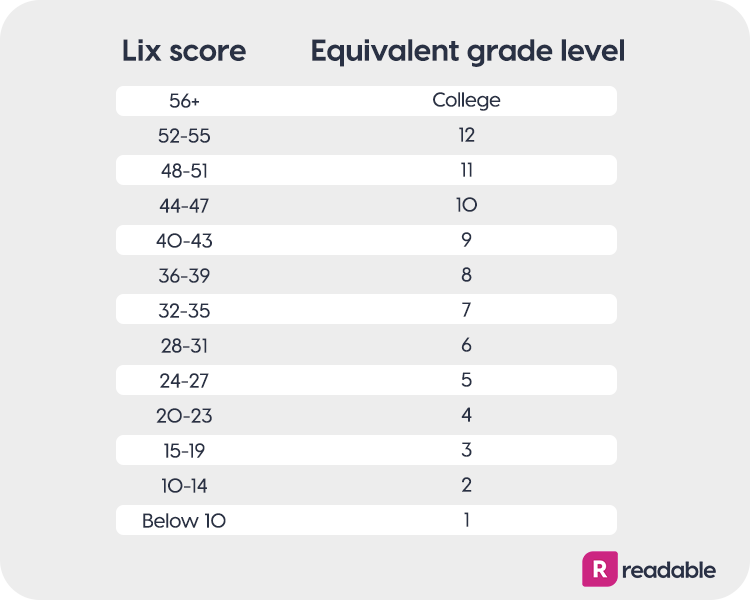 If you’re writing for the general public, we recommend aiming for a Lix score of 40 or below, and a Rix grade level of around 8.